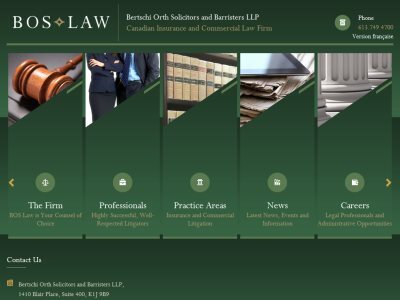 Bertschi Orth Solicitors and Barristers LLP is a Canadian Insurance and Commercial Law Firm in Ottawa, Ontario. Practice Areas: Insurance Litigation, Commercial Litigation. Practice Areas (Insurance Litigation): Property & Casualty Insurance, Personal Injury & Motor Vehicle Claims, Statutory Accident Benefit Claims, Priority and Loss Transfer Disputes, Life and Disability Benefit Claims, Coverage & Jurisdictional Claims, Product Liability Claims, Professional Errors & Omission Coverage, Directors & Officers Liability Insurance, Commercial General Liability, Professional Liability. Practice Areas (Commercial Litigation): Educational Litigation, Construction Litigation, Employment Law, Corporate Litigation, Estate Litigation.